Discussion in 'Luthiery, Modifications & Customizations' started by Manurack, Jan 5, 2013. I absolutely love the way it looks, especially with the chrome pickups covers, hardware and amazing pickguard! And for the comments about "why not just buy a Natural Stained Explorer " I want to do this because modding my guitars is a hobby I've had for many years! 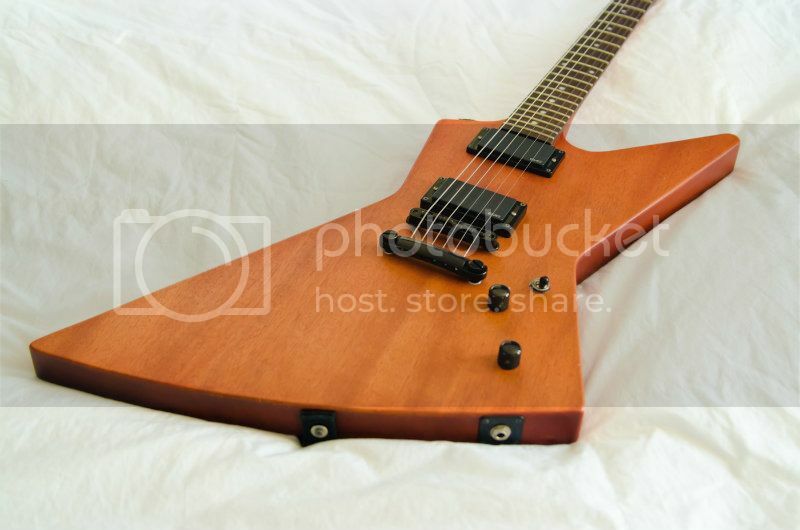 Here's what I have in mind: my black Gibson Explorer. My Gibby will look sooooo good with the nice wood stain and black hardware! Then do it. It won't look like that Ken Lawrence, obviously because of the top being figured. But you could match the other two. The KL is a crazy figured top so your not gonna get that result. The other two are just oil finishes, not stain. You will have an incredible amount of work getting your guitar stripped enough to put an oil finish on and have it look good. Also you have to hope the mahogany underneath looks good. It could be ugly or be a several piece body. Also you will have all those pickguard holes which wont match 100% if you fill them. As you said yourself the best option is buying an oil finished Explorer. It would not look like the ones you have listed above, seeing as all of them have no pickguard. I think its a cool project, and it would look nice. I would be carefull, cause Gibson often uses bodys made of many pieces of wood under opaque lacquer.... the grain may not be matched and it may look quite awfully. Us made gibsons that are painted are made from at least 3 pieces. Food for thought, op. Not wanting to rain on your fire, but if the result is in the same ballpark as your stagemaster, just don't. Continue to practice on cheapo guitars before trying more expensive instruments for now. oh dear. instant onset of GAS. that's just lovely. If he's willing to play around with veneering it then it could be made to look very nice without a pickguard. One would need to make some wood fillers to make the wiring trenches into tunnels and then veneer on top of that, but it's possible with some careful effort. If that's the way forward then the multi-piece body won't be so detrimental to the appearance, even if it turns out to be horribly mismatched. But yeah- be a little more thorough and careful with this than with the Stagemaster, please. My $0.02 is to leave it as is or take it to a pro. 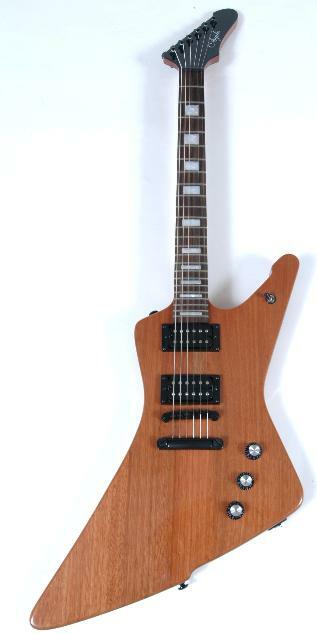 or sell this one and buy a natural coloured Explorer. 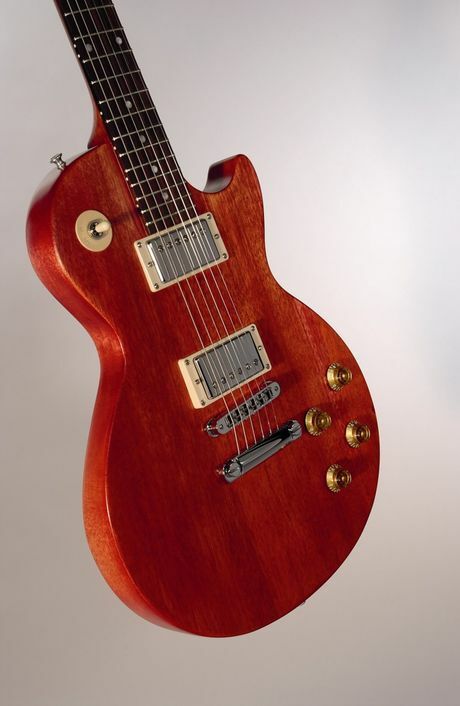 a buddy of mine has a mahogany LP studio, worn brown (kinda see-through) finish, with the wood grain showing. Took a lot of time to figure out whether it was a one piece body or not. It wasn't. Oh yeah, that... Gotta be very meticulous mapping it out, cutting a good neck pocket in the veneer, etc. The Explorer is fully flat-topped, right? That'd make it a little easier at least. thanks, point taken. but hey, who doesn't like to play lottery every once in a while? Dude if they didnt have natural explorers already, Id say "go for it", but in this case, he really should just try and trade for one imo. 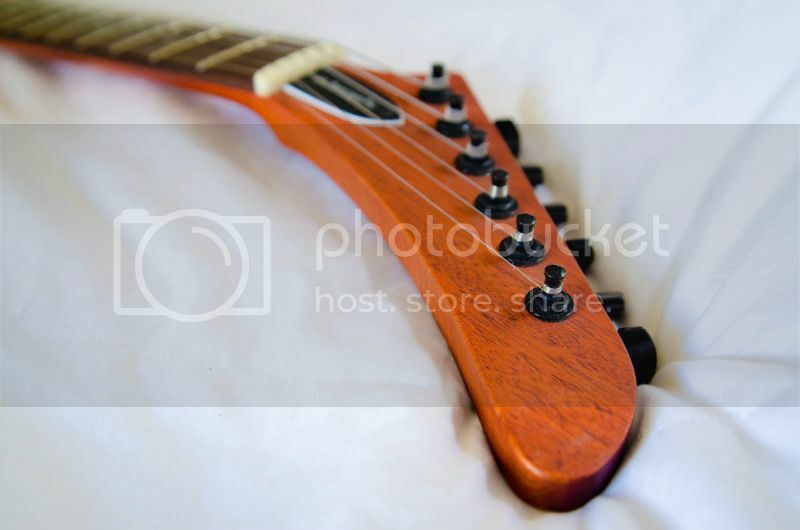 Im 110% positive gibsons have AT LEAST 3 peices with their painted bodied guitars, so the odds of it looking good, are very slim.